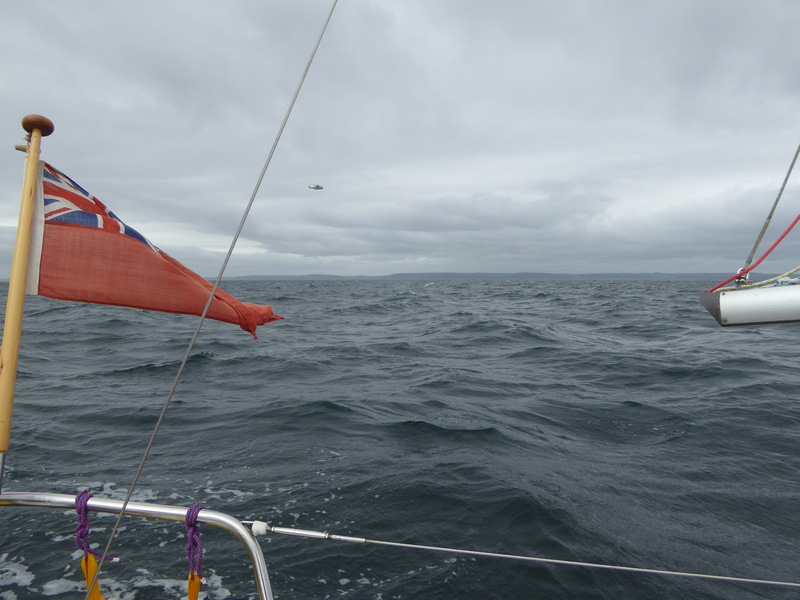 Little wind now, but the forecast of more later – in the right direction. 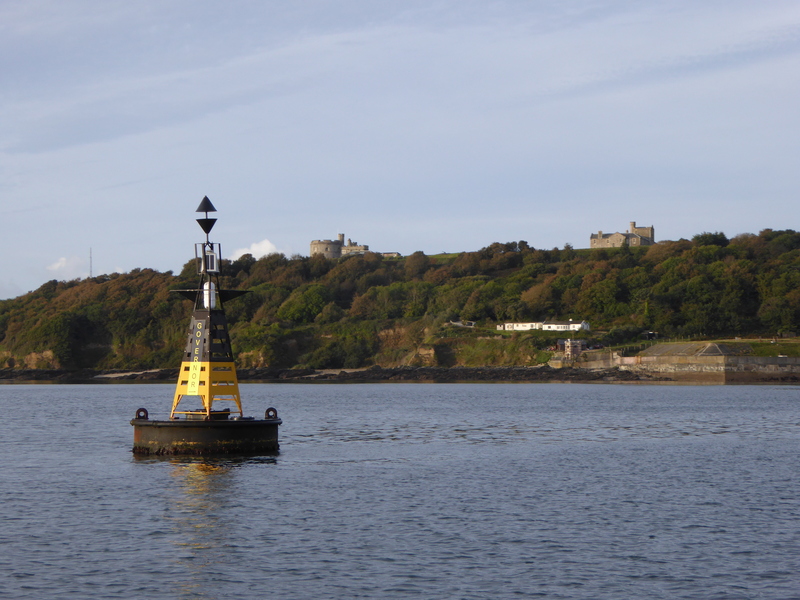 I left the mooring at 0745 and motored out into Carrick Roads. All was quiet. 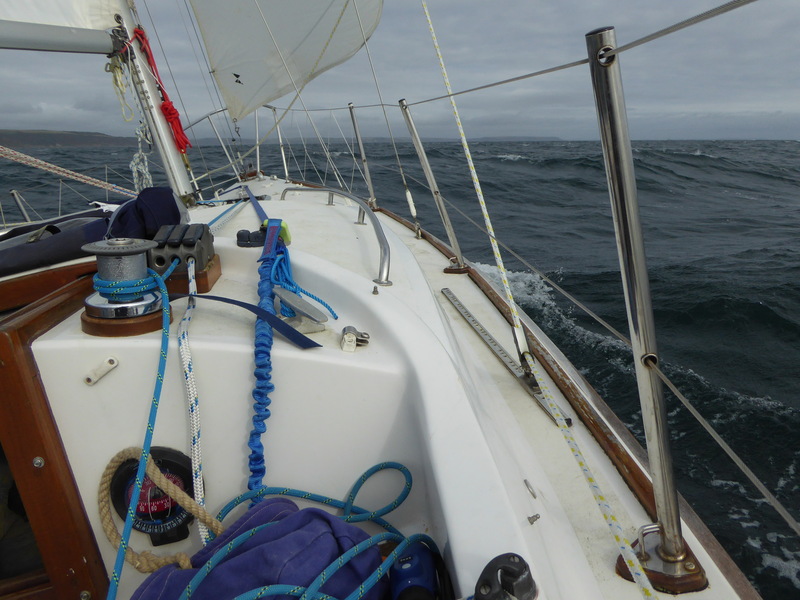 With redundant mainsail set, I motored as far as the Dodman with a following wind gradually building. 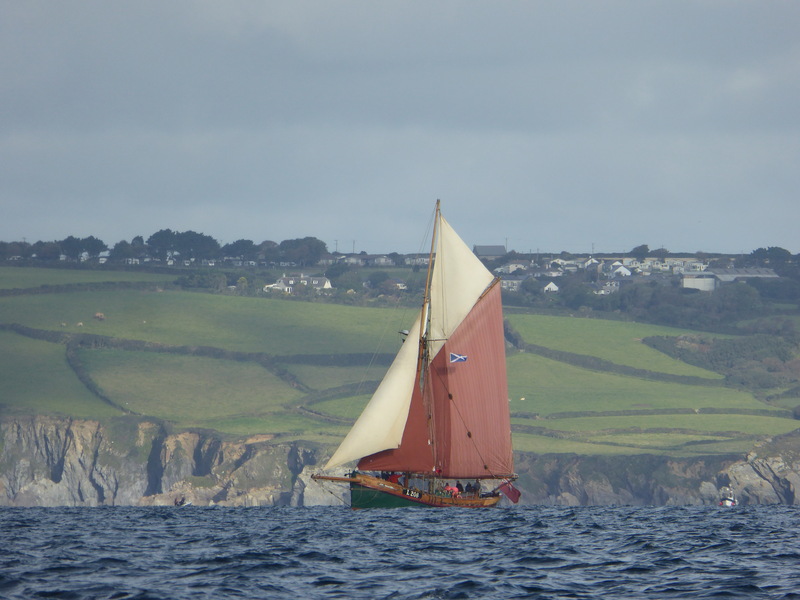 Watching the Eda Frandsen make her way from the Mevagissey direction and raising her topsail, I decided there was enough wind to kill the engine and set my genoa. 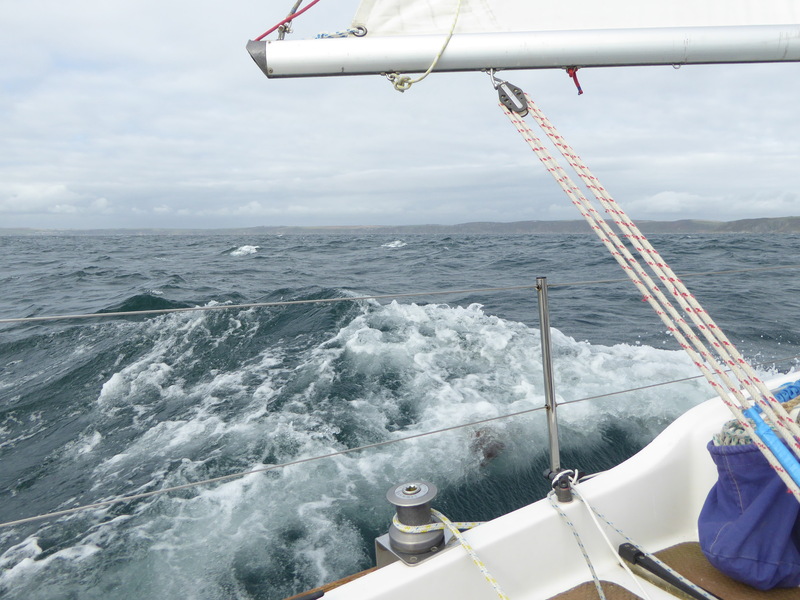 In fact it was another half hour before we were sailing at the hoped-for four knots plus. And now I can see a whole new vista. 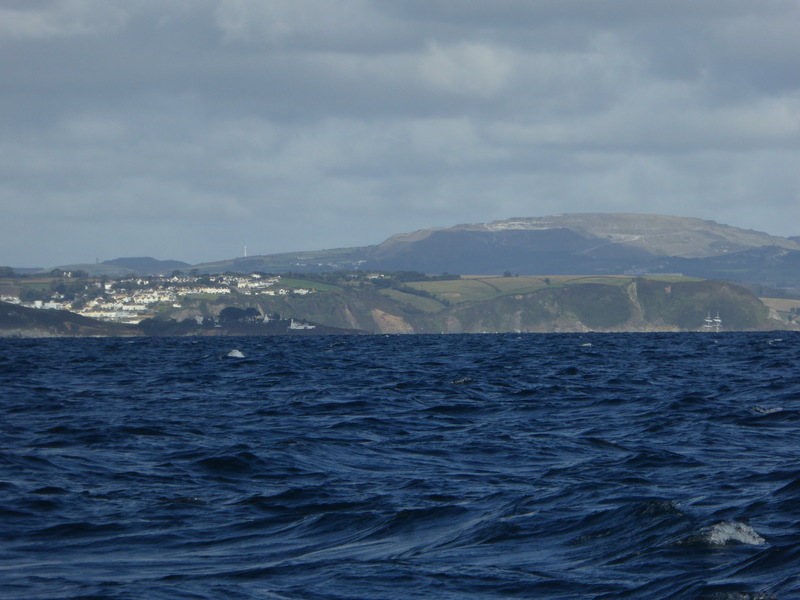 We have already passed Gerrans and Pothscatho, Nare Head and Gull Rock, Veryan, Portloe and Caerhays Castle, Passing the Dodman opens up Gorran Haven and now in the image below Chapel Point with Mevagissey behind and Penare Point beyond – and the well-known hinterland of china clay workings. To my shame I was so busy looking at the land that I missed the topsails on the right of the picture – a brig or brigantine? I have been reading E V Thompson ‘Jago’ Trilogy, (‘The Restless Sea’, ‘Polruddin’, ‘Mistress of Polruddin’), set along this stretch of coast. On the Ordinance Survey map which I carry alongside the charts, I see a Polruddin Farm in exactly the spot I imagine the setting to be. They are very good tales. 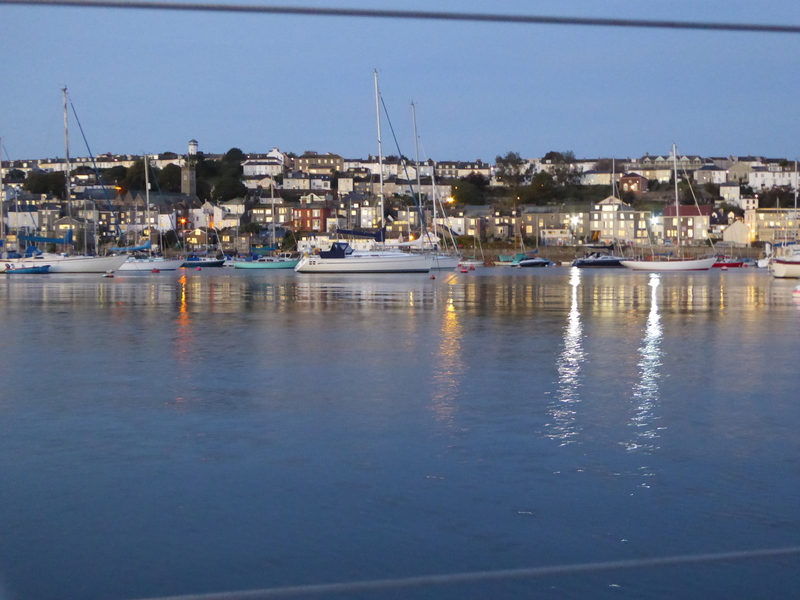 Daphne du Maurier’s Menabilly is across St Austell Bay behind Gribben Head which I photographed earlier in the passage. 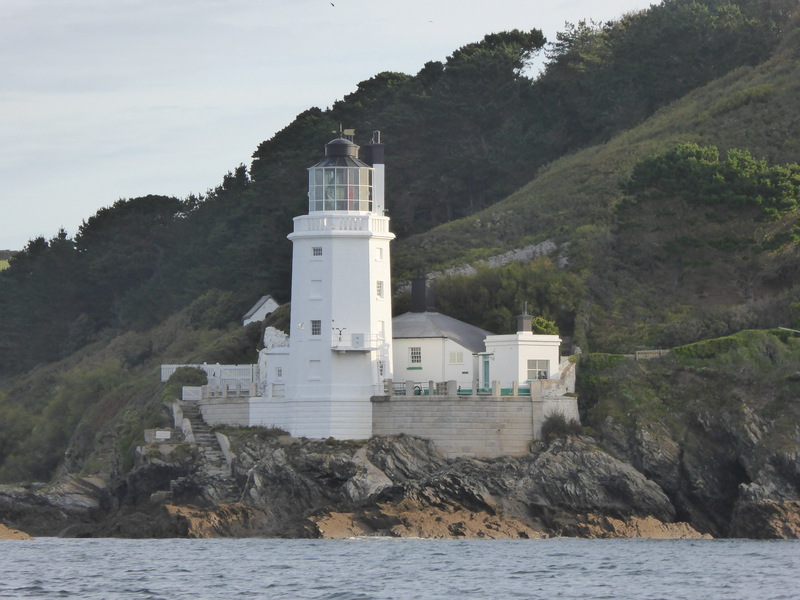 “Last night I dreamt I went to Manderley again” has to be the most haunting open sentence of all time..
Now its Par with St Austell inland, Fowey and Polperro and Looe, Downderry, and Portwrinkle before Rame Head then Penlee Point and into Plymouth Sound. 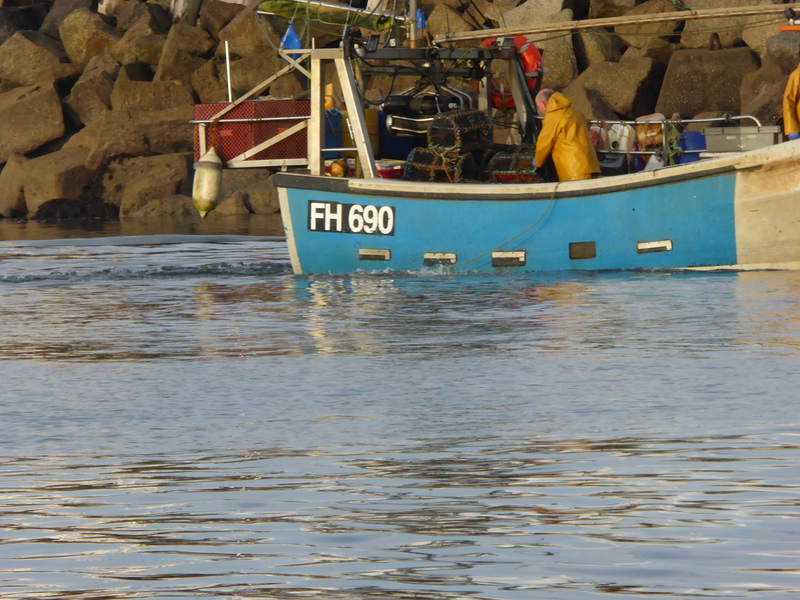 The fishermen never stop . 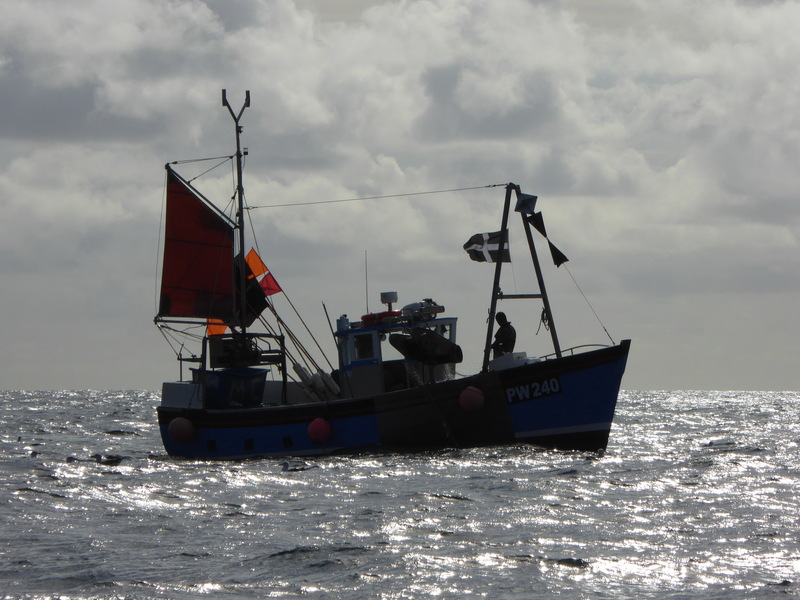 . .
All the while the wind was rising and with it the sea. The navy were on maneuvers . 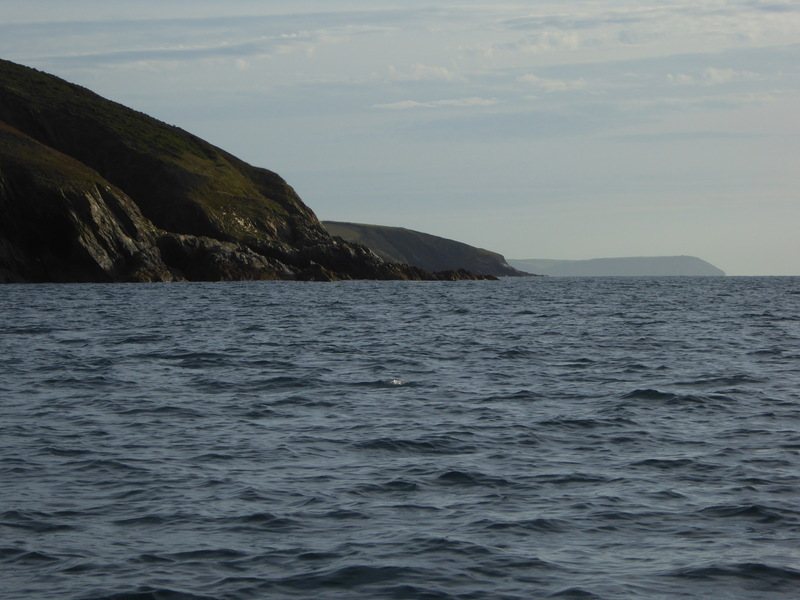 . .
At around 1615, south of the Draystone buoy, I gybed carefully and, keeping in close to avoid the warships, swept into the welcome shelter of Cawsand. 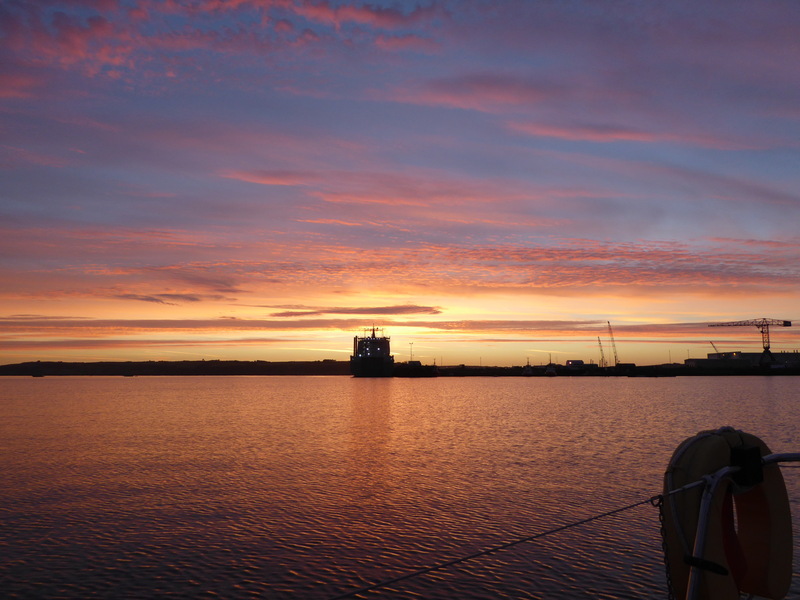 I enjoyed the peace and quiet, stowing sails and generally clearing up before motoring back into the wind and across an unpleasant swell in the Sound to the mooring I left over two weeks before . . . happy and a lot wiser. Excellent photos. Thank you Bill.